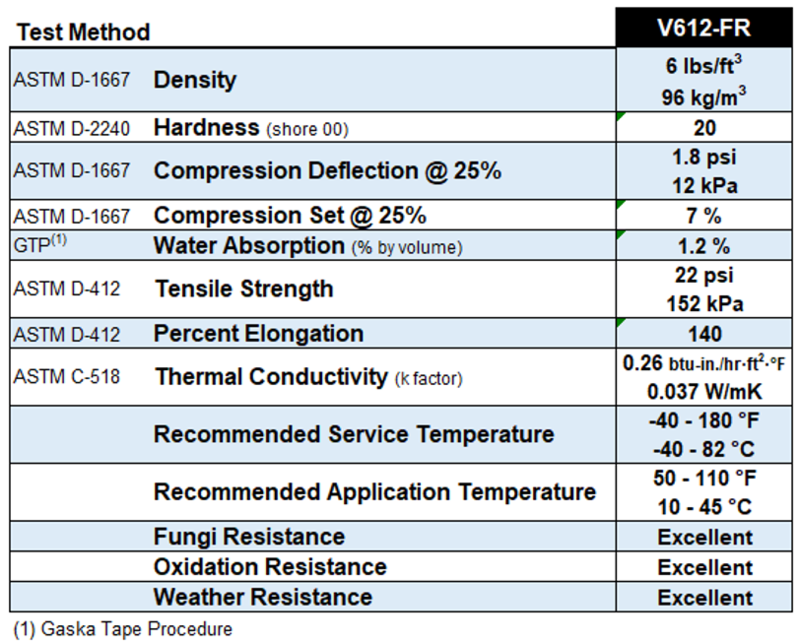 V612-FR Series – Gaska Tape Inc.
V612-FR consists of a closed-cell Polyvinyl Chloride foam permanently cast on heavy-duty aluminum foil. Vyn-Alum acts as an effective insulator and prevents condensation or moisture build-up on surfaces to which it is applied. Flexes to fill in and seal irregular surfaces. Reduces vibration and deadens sound in H.V.A.C. applications. An excellent thermal barrier to eliminate heat transfer from pipes and ducts. Eliminates condensation and moisture build-up on water pipes. A standard (G1) emulsion acrylic adhesive is used and suitable for substrates that consist of low temperature applications and oily surfaces. Gray color standard for the foam. NOTES: V612-FR, aluminum foil, foam, adhesive, the composite of these three components meets FHC 25/50. The standard thickness manufactured is .125”. Up to .250” available upon request for quotation.